I won't pretend to be an expert of any Asian cuisine. However, I know enough to see that the city is flooded with "Toronto Thai" led by the success of one particular chain with dishes that are syrupy sweet but lack discernable spice. For that reason I'm always a bit skeptical of Thai restaurants and "best of" lists have become a must for deciphering where to go. It was difficult choosing a menu item; everything looked really tasty with great prices ranging from $6.45-$7.95. I finally settled on the seafood in bean sauce platter, accompanied by mango salad, a spring roll and rice. The first thing that impressed me was the spring roll. Often they are oily, heavy and leave your fingers greasy. Mine my crisp, light and flavourful. I could tell it wasn't cooked an hour before lunch service and left to sit under a warming light. I knew I was off to a good start. Although it was a lunch special, the kitchen didn't skimp on the seafood. The dish was loaded with shrimp, scallops and mussels in a sauce that had a great depth of both garlic and chili flavours. The mango salad was a perfect side to balance the flavours. 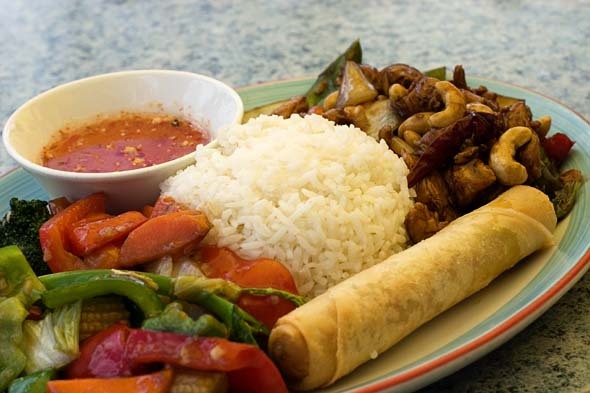 My lunch mate chose the cashew chicken with mixed vegetables, spring roll and rice. I tend to avoid cashew chicken as I've had it several times where it appears to be simply overwhelmed with oyster sauce, but this dish was more complex with a savory blend of onion, garlic and chili flavours. My only complaint about the lunch is the service was both slow and surly. I didn't mind because I had the day off but I could never go during the work week. I've heard Satay on the Road delivers authentic Thai and Malaysian dishes and I'll be back to try some of their specialties for dinner. Satay on the Road is located in the heart of Leaside Village on Bayview with another location available on Avenue. Open Mon-Fri: 11am-10:30pm, Sat: 12pm-10:30pm, Sun: 4pm-10:30pm.